Sorry if that is a really depressing title but unfortunately it is true, most of our attempts to change our health/weight, especially New Year’s Resolutions fail. I have decided to write about why this happens, to help you break the cycle. 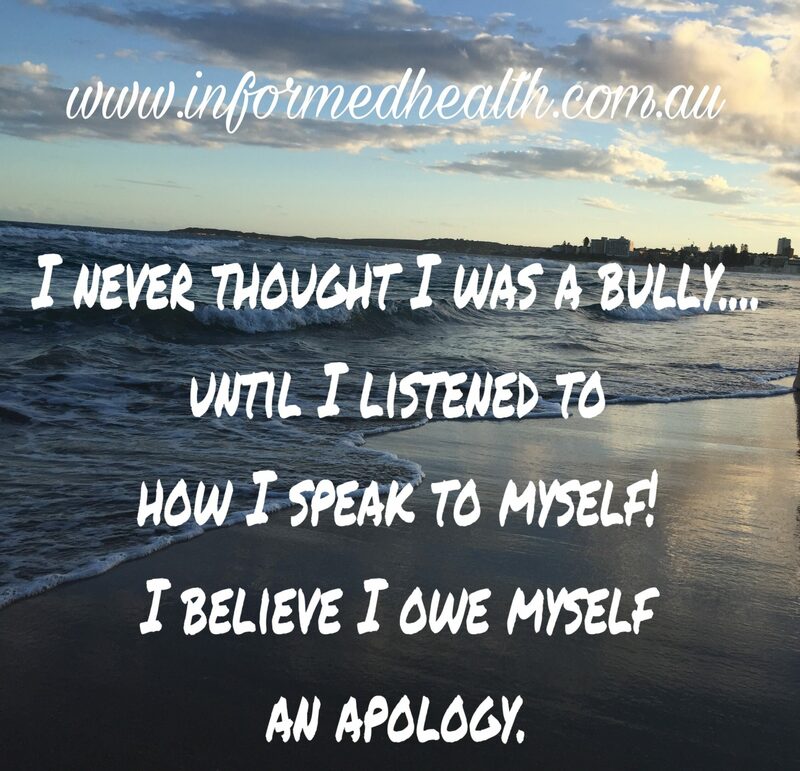 In my personal experience and with many clients I have observed one thing most of us have in common, many of us are bullies, we bully ourselves! Yes that’s right, we are very unkind to ourselves. You would never talk to a friend the way you talk to yourself! Do you even believe you can achieve good health and fat loss? Do you believe you deserve to or are you still punishing and shaming yourself for being in this situation in the first place or being in this situation again when you promised yourself you would never come back to this place? Do you constantly talk to yourself about will power or your lack of it? Do you punish yourself through exercise and deprive yourself of food and then fall off the wagon and go through the whole process again? It is important to forgive yourself for how you got here so you can move on; this is what keeps many stuck on the merry-go-round. Starting a health journey with anger, shame and lack of forgiveness for ourselves is a disaster waiting to happen. It is like building your house on quicksand. If you were supporting someone else through their journey, you would be kind and you would forgive them and offer them love and support which you understand they need for success. But apparently we don’t need it for our own success, really? 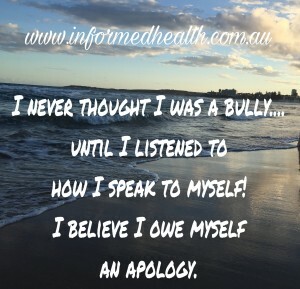 Do you really believe that shaming and hating on ourselves is the key to good health! How’s that working for you? Our health journey needs to begin with self compassion and love. Many people believe that we can only love ourselves when we become “worthy”, when we get “there”, size 10 or whatever your “there” is. Guess what, nobody instantly starts loving themselves when they get “there”, actually quite the opposite. They feel like an impostor, I often hear people who have had big weight loss describe themselves as “being a fat person in a thin persons body”. They can’t come to terms with this and therefore put the weight back on to feel comfortable with themselves. This is an actual syndrome that doesn’t just apply to weight loss. It’s called Impostor Syndrome (also known as impostor phenomenon or fraud syndrome) a term coined in 1978 by clinical psychologists Dr Pauline R Clance and Suzanne A Imes referring to high-achieving people with an inability to internalise their accomplishments and a persistent fear of being exposed as a “fraud”. We need to let go of our need for perfection (which is impossible) and practice acceptance of ourselves and self-care right from the beginning. Your health and weight goals need good foundations to build on. You simply cannot hate yourself to health! You need to start from a place of kindness, compassion, forgiveness and love, your journey should be about nourishing and healing your mind and body. If you need help with this, seek a professional psychotherapist, hypnotherapist or counsellor, we can’t always do it alone, a lifetime of self-loathing can be hard to break. At Informed Health, our consultations are not limited to nutrition, we have a holistic approach to your needs and look at various aspects of mindset and lifestyle to help you achieve your goals. Call 47 222 111 or go to our home page for more information. 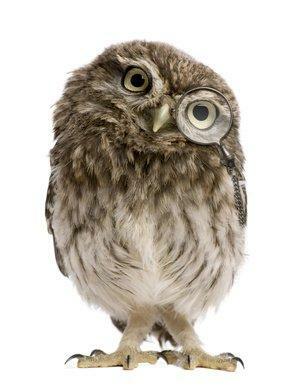 We are based on Penrith and Kurmond and also do Skype consultations.